A man who jumped from Niagara Falls was rescued from the chilly waters naked and alive. Check out photos of the dramatic Niagara Falls rescue and take in our daily list of must-reads that will have you chatting at the lunch counter, over instant message or wherever it is that people actually talk these days. A man who jumped from Niagara Falls was rescued from the freezing waters naked and alive. The man took the 180-foot plunge from the Canadian side of the Falls but incredibly resurfaced about 40 feet from a power plant and suffered only a head injury and hypothermia. Researchers say that artificial life could be created "within five years." A synthetic living system that could be used to create new drugs or greenhouse gas absorbers is within reach, scientists say, and could lead to the creation of machines that possess human qualities. Take a peek at amazing photos of a harrowing two-hour battle between a man and a 12-foot tiger shark the Gulf of Mexico. 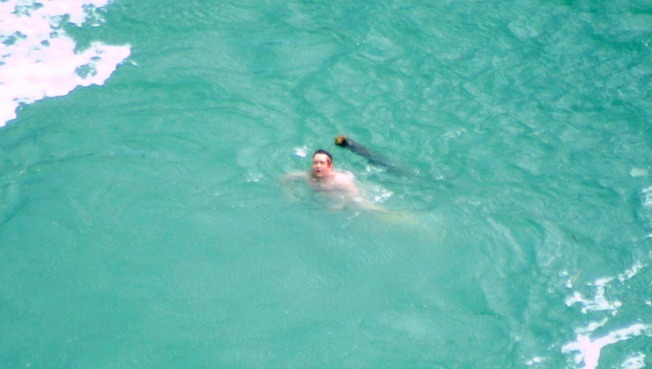 The man and his two friends were hunting tuna when he noticed the massive beast circling him. He speared the shark seven times before killing it with a long blade knife. Take a tour of the parking lot at the Phish reunion show in Virginia and meet some of the characters like the guy who traded hash for tickets or other members of the "Phellowship." Every jam band fan worth her salt knows the real show is on Shakedown Street. Our favorite attendee? Magoo.